We are a leading Wholesale Trader of hand pallet truck for warehouse from Mumbai, India. We are offering a vast quality range of Hand Pallet Truck for Warehouse, our products are as per international quality and safety standard to meet the market demand. These hand pallet truck for warehouse are highly appreciated by our valuable clients, our products are made for heavy duty work. 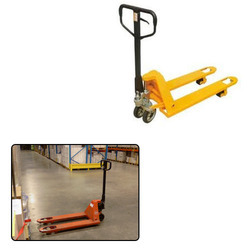 Looking for Hand Pallet Truck for Warehouse ?